Kenjin társasjáték - Magyarország társasjáték keresője! A társasjáték érték! A Kenjin egy nagyszerű társasjáték, 2 - 4 játékos részére, az átlagos játékidő rövid, csak 30 perc. A társast, 12 éves kortól ajánljuk kipróbálni. A játékmenet erősen épít a visszatartott információ és a terület befolyásolás/irányítás mechanizmusokra. A merciless war is raging throughout feudal Japan, fueled by the hunger for power or the desire for peace of its great lords. As one of them, you must defend your territory from the enemy threatening your borders. Now it's time to command your troops and read through your opponent's strategy to take over the battlefield and prevail! 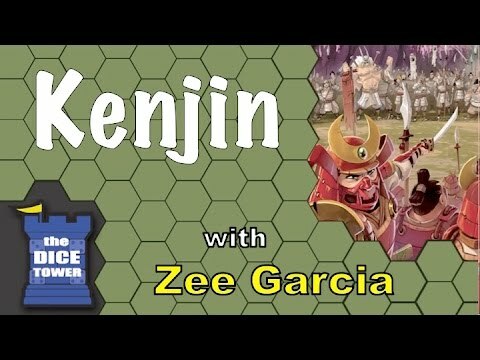 Kenjin is a quick and subtle card game of bluffing and tactics. You share two random battlefields with each of the players next to you: one worth 4 points, the other 6. You get a hand of thirteen cards numbered from 0 to 3. They are your peasants, thugs, lords. On your turn, send two of them to one or two of your battlefields. When all the cards have been played, each battlefield is won by the player with the highest sum of card values there. Some cards are always played face up, others always face down. Some of them also have a special power: Use your peasants (0) to lure your opponent's troops to a battlefield, or to score more points if they survive. Play a Lord (2) early as it's strengthened by each new reinforcement thereafter. Terrains also impact a battle's outcome: Peasants take arms to protect their rice fields, while military strength is not always enough when you fight over a palace. Once each battlefield has been scored, the player with the most victory points wins. This is a promotional battlefield for Kenjin. To win this battlefield, you must have a lower strength than your opponent.